THE MAGAZINE BEHIND NZ'S EXPORT DRIVE PACKAGING & LABELLING FOR ASIA ★ EYEING UP THE MIDDLE EAST ★ SMARTFOODS' SMART CHOICES ISSUE 40 SPRING 2015 SEEING IP EYE-TO-EYE WE REVIEW CHINA'S FAST-CHANGING IP LANDSCAPE. PAGE 20 DELIVERING WHAT IT TAKES OUR SPECIAL REPORT ON FREIGHT & LOGISTICS. PAGE 32 A STAND THAT DELIVERS PROVEN TIPS ON EXHIBITING AT OVERSEAS TRADE SHOWS. PAGE 38 WHIPPING UP CREAM . 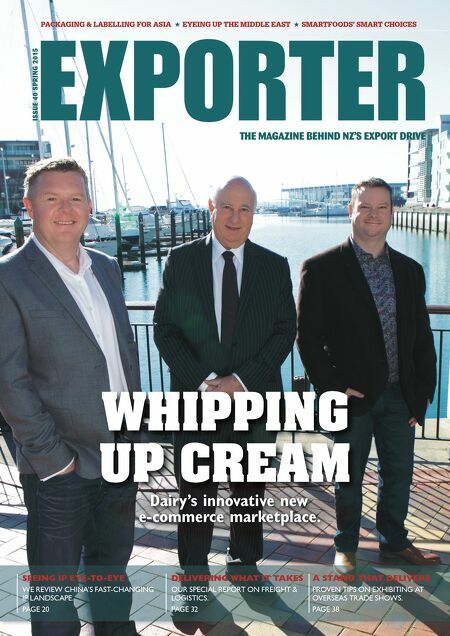 Dairy's innovative new e-commerce marketplace.